The MuIn is a versatile Multi Interface Board. It is useful in many applications: robotics, automation, control, development, etc. 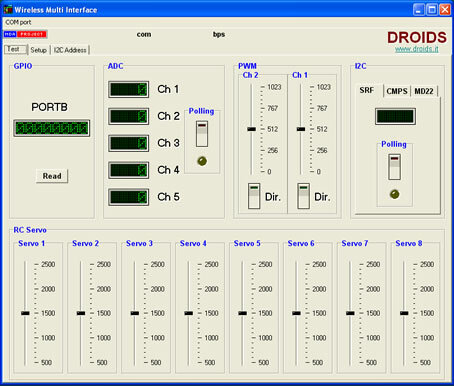 Many Users use the MuIn to equipe their devices and applications for small series production. They also use their own firmware and connections. They asked for a cheaper version and usually do not need all the connectors and headers. Here it is! A “light” MuIn version, only the essential headers and connectors, without the preloaded firmware and with a lighter price. It is identical to the MuIn but we removed all the I/O and ADC connectors, the PWM and I2C connectors and comes without the spare headers. The MuIn is a versatile Multi Interface Board. It is useful in many applications: robotics, automation, control, development, etc. 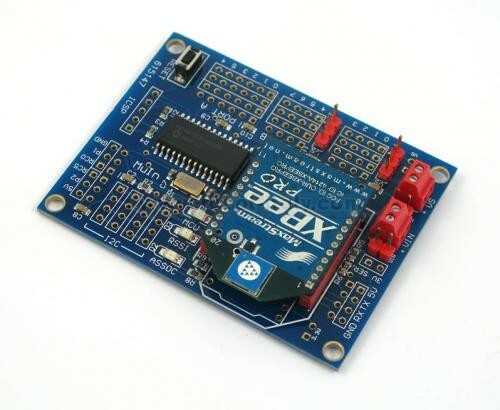 The board is equipped with a powerful PIC18F2520 running at 40MHz It comes preloaded with a bootloader*, for serial programming and upgrading, and a firmware* full of features. The MuIn can drive two H-Bridges with two PWM channels and two enable I/O. It can read up to five analogical devices such as temperature sensors, potentiometers, distance sensors, etc; with a 10Bit resolution. With Port B it can drive 4/8 R/C servos or it can read or write 4/8 I/O ports. 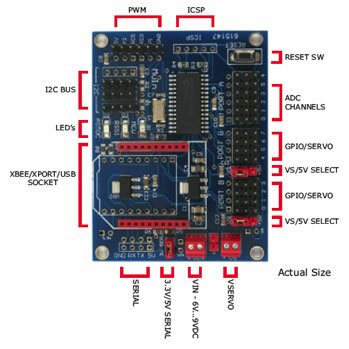 With the I2C bus you can control almost any I2C devices, sending the commands through the serial connection. With special commands you can easily read almost all of the Devantech I2C sensor and devices and with the free GUI* (Graphical User Interface) you can program the device ID with a mouse click. 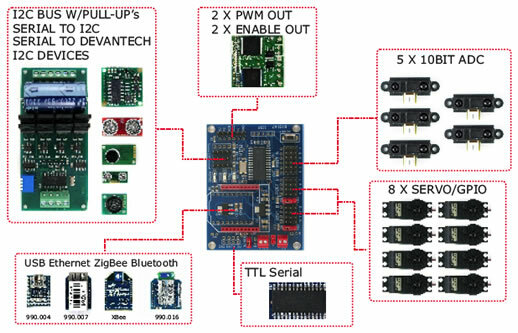 There are several ways to send and receive data to and from the MuIn, thanks to its socket you can use an XBee module to make a ZigBee connection, with an XPort module (the 990.007 adapter is needed) you can make an Ethernet connection, you can talk to the MuIn through the Internet or a LAN. With our 990.004 USB to Serial converter, you can easily connect the MuIn to your PC USB port. Last but not least, the firmware is made to be compatible with the free version of the Microchip C18 compiler and it is Open Source (for non commercial use). You can also use the MuIn 990005 as a powerful development board for the PIC18F2520. The preloaded software and the free GUI is just for demonstration purposes we do not give any warranty. The firmware is open source you are free to modify it and use for studying, learning and testing the capabilities of the MuIn Board. We will be very happy if anyone will share their software with other Users on our Forum: www.robot-italy.net For any question or help with the firmware and the GUI, ask to our Forum, we do not provide direct support on software. *The bootloader has been tested with our 990.004 USB to serial converter. It may not works with other configurations. The best way to program the board is a good PIC Programmer.